Fun Online Games for All Ages! Easy crosswords are educational, fun and FREE! This website is an informational and fun place for kids of all ages! These printable crossword puzzles are FREE! They're, mostly, easy for kids or adults. Crossword puzzles stimulate thinking skills, boost memory, expand vocabulary and improve spelling. They're fun to play at parties, socials or other gatherings. Play them with family or friends. Play them alone. Use them as teaching tools in classes or workshops. Play them at home or take them traveling. The choice is all yours. 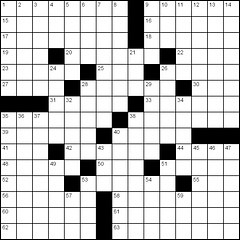 The crossword helper key holds the answers to all puzzles. First, try playing crosswords without using the key. Use the crossword helper key to check for accuracy or make corrections. No peeking ahead of time! These crosswords consist of various topics. Just choose the one(s) you'd like to play. There are many FREE crosswords at this website. You may want to try these puzzles too: "Sunday Crosswords", "Daily Crosswords", "Math Crossword Puzzles" and "Crosswords for Kids". If you haven't had enough of these fun online games, be sure to check Amazon.com. Find a large variety of crosswords, in book form, for kids and adults! DIRECTIONS: Left click to view; Right click to download for print. Click the answer key to check for accuracy or make corrections. NOTE: Young children may need extra supervision or guidance.